How will this template help me and my business? If you're working on your first digital strategy review it can be difficult to know if you're using the best structure, or using the right tools to assess your capabilities and strategic options. This Powerpoint template is designed for reviewing digital marketing performance and discussing online strategic alternatives in strategy workshops – that’s how we use it! It includes many different visual 'mindtools' to help you evaluate the best way forward. Even if you're a digital marketing veteran, you can compare it to your approach and use it to create more persuasive summaries of your digital strategy that you can present to colleagues or clients. The template is lightly branded so you can easily amend it and format it for your company or your clients. In this slidedeck we also have additional visuals to explain RACE Planning and managing the customer lifecycle to support your presentations. Related resources: Digital strategy templates in Word – our companion workbook contains a more comprehensive range of templates. RACE Digital Marketing Elearning course – an online course stepping members through the 25 main activities needed to manage digital marketing. Dave is co-founder and content director of Smart Insights. He is editor of the 100 templates, ebooks and courses in the digital marketing resource library created by our team of 25+ Digital Marketing experts. 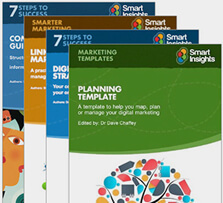 For his full profile, or to connect on LinkedIn or other social networks, see the Dave Chaffey profile page on Smart Insights. Dave is author of 5 bestselling books on digital marketing including Digital Marketing Excellence and Digital Marketing: Strategy, Implementation and Practice. In 2004 he was recognised by the Chartered Institute of Marketing as one of 50 marketing ‘gurus’ worldwide who have helped shape the future of marketing.